Elite Stat: Marcus Mariota’s adjusted completion percentage was 77.4 percent on Monday night. 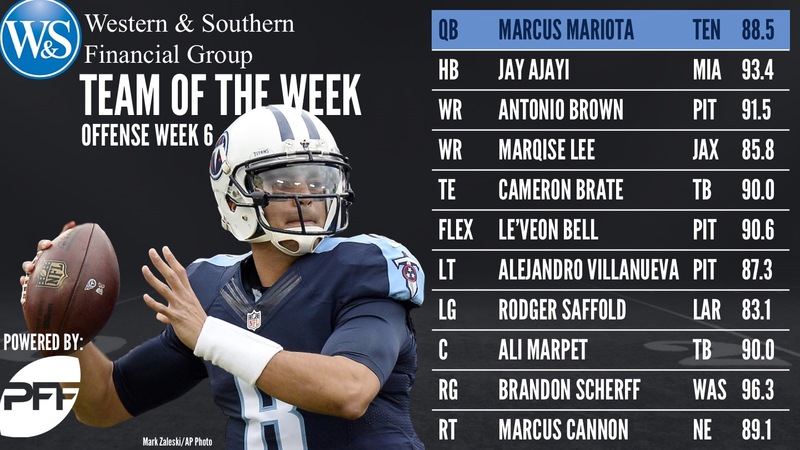 In what wasn’t a vintage week for quarterback performances, Marcus Mariota’s performance while far from 100 percent in his return from a hamstring injury on Monday night was impressive, and ultimately helped lead his team back from behind to take the spoils of victory. Mariota had a perfect passer rating of 158.3 while under pressure, and did that despite not being able to take off and use his athleticism in the way he ordinarily would. Elite Stat: Jay Ajayi gained 3.69 yards per carry after contact this week. The Dolphins were in a hole in this game, but they continued to lean on RB Jay Ajayi, who was huge all game. He ended up with 130 yards on 26 carries, with 96 of those coming after contact. Ajayi was such a monster on the ground that he makes the team despite dropping two of the three passes thrown his way. Ajayi’s average was more than double that of his backup Damien Williams on his four attempts. Elite Stat: Antonio Brown gained 6.5 yards per route run, best in the league this week. Once again Antonio Brown was unstoppable as he ended the day with eight receptions for 155 yards and a touchdown. He did cause an interception from Ben Roethlisberger when he stopped his route on a slant and allowed the ball to be fired straight through to Marcus Peters, but he more than made up for it by catching a pass that should have been picked off late in the game after it clanged off the face of CB Phillip Gaines, then evaded a tackle and sprinted all the way to pay dirt. Elite Stat: Marqise Lee dropped none of the nine passes thrown his way. Marqise Lee didn’t have the world’s most gaudy receiving numbers, with just five catches for 83 yards, but he made a lot happen after the catch to get those yards, gaining 54 of the 85 after the catch and forcing at least seven defenders to either miss tackles on him or overrun the play and lose their chance at stopping his progress. Elite Stat: Cameron Brate gained 2.92 yards per route run this week. Catching a pass from Ryan Fitzpatrick for a touchdown after Jameis Winston left the game with an injured shoulder produced the first Harvard to Harvard touchdown pass in NFL history, but Brate also made several other key plays in a comeback attempt that ultimately fell short. Brate also graded well as a run blocker, but allowed one pressure from four pass-blocking snaps. Elite Stat: Le’Veon Bell broke ten tackles this week, the most among all running backs. We got to see the best of Le’Veon Bell once again against the undefeated Chiefs. Bell was impossible for the Chiefs defense to contain, and seemed to be easily gaining significant yardage every time he touched the ball. He broke ten tackles in the game, by far the most in the league this week, and nickel linebacker Daniel Sorensen in particular seemed completely unable to stop him one-on-one. Elite Stat: Alejandro Villanueva allowed two total pressures this week.. Though he allowed a sack and a hurry on 27 pass-blocking snaps, Villanueva was a monster in the run game for the Steelers this week against the Chiefs. Pittsburgh averaged 5.9 yards per rush on carries that went immediately either side of his blocking, and he made multiple plays at the second level, eradicating linebackers and collecting more than one pancake block over the course of the game by flooring his assignment. Elite Stat: Rodger Saffold allowed just one sack across 26 pass-blocking snaps. The Rams didn’t pass a whole lot this week against the Jaguars, and though Rodger Saffold did give up a sack, it was the only pressure he allowed across 26 pass-blocking snaps. He was able to assert himself in the run game against a Jaguars defense that has not been as dominant against the run as it has been in pass-rushing, and RB Todd Gurley gained 59 yards before contact overall. Elite Stat: Ali Marpett allowed two pressures from 46 pass-blocking snaps. Ali Marpet allowed a sack and a hurry against the Cardinals, which isn’t bad from 49 pass-blocking snaps as the team chased a lead for much of the afternoon, but it was his work in the run game that really separated him this week. Marpet made plays against Cardinals defensive linemen and at the second level at the point of attack and on the move, even though it made little impact on the team’s inability to run the football. Elite Stat: Brandon Scherff allowed no pressures from 39 pass-blocking snaps. Brandon Scherff posted the best grade we have seen from a guard so far this season in a dominant outing against the 49ers, who have a formidable group of defenders up front. Scherff had a perfect game in pass protection across 42 passing snaps, but was a force in the run game and on the move on screens, accurately identifying targets and eradicating them with explosion on contact. Elite Stat: Marcus Cannon allowed no pressures this week against the Jets. Marcus Cannon didn’t allow any pressures across his pass-blocking snaps, but also had an impressive day as a run blocker. He was particularly effective against Muhammad Wilkerson, who looked like a shell of his former self and was completely unable to hold up at the point of attack. Cannon also generated significant movement on the edge against edge defender Ed Stinson. Elite Stat: Aaron Donald notched ten pressures against the Jaguars. For the second week running Aaron Donald notched ten total pressures, and now has as many pressures over the past two weeks as Kawann Short has over the entire season. Donald tore the Jaguars offensive line to pieces on the inside, gaining multiple pressures against all three of the Jags’ interior linemen. Donald was relatively anonymous in the run game this week, but more than made up for it with his pass-rush, generating pressure on more than 25 percent of his rushes. 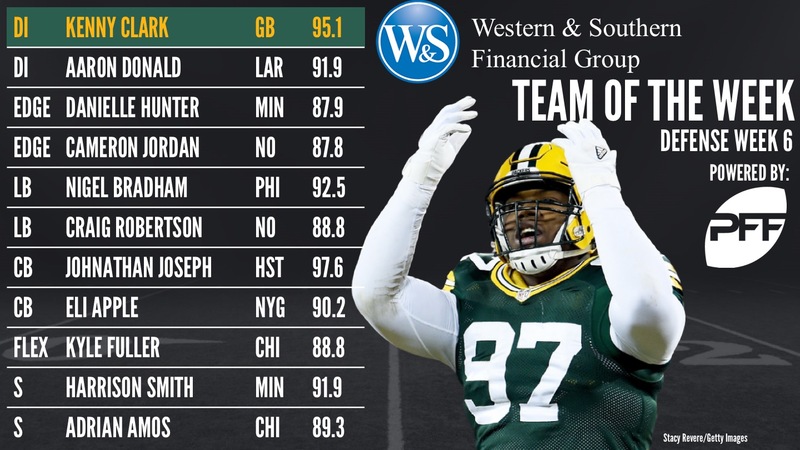 Elite Stat: Kenny Clark had a run-stop percentage of 24.0 against the Vikings. The Vikings gained 112 yards on the ground this week against the Packers, but it took them 33 attempts to get that far, and one of the standouts on the Packers line was interior defender Kenny Clark. Three hurries from 30 pass-rushing snaps wasn’t a bad output from Clark, but he had a team-leading six stops in the run game, despite just 25 snaps against the run. Elite Stat: Danielle Hunter had six total pressures from 35 pass-rushing snaps. The Green Bay Packers finally had their starting complement of offensive tackles back up and running, but they ran into one of the tougher tests in the league in the Minnesota Vikings this week. Hunter generated six total pressured from his 35 pass-rushing snaps, and chipped in with a defensive stop in the run game as well as forcing multiple cuts from the running back at the point of attack. Elite Stat: Cameron Jordan had 9 total pressures against the Lions. Elite Stat: Nigel Bradham allowed just two receptions for 10 yards in coverage on Thursday night. Nigel Bradham was one of the stars of Thursday Night Football, making ten solo tackles and a team-leading six defensive stops. Bradham was thrown at five times in coverage, but allowed just two receptions for ten yards, while breaking up two of the incompletions, including a full-stretch deflection to prevent a pass going behind him that would have been for a significant gain. Elite Stat: Craig Robertson had a monstrous run-stop percentage of 46.2, best in the league. Craig Robertson had a team high seven defensive stops in the game, and graded well in all facets that PFF measures. He rushed the passer eight times on the blitz, notching one sack, but he also allowed just one catch for 22 yards in coverage, albeit a catch that went for a touchdown. This was one of the best games of Robertson’s career. Elite Stat: Johnathan Joseph allowed just 0.10 yards per cover snap this week. Johnathan Joseph couldn’t seem to get out of the way of the football this week against the Browns, notching two interceptions from only six targets, bringing one of them all the way back for 6 points. Joseph overall allowed just two catches for three yards, catching as many passes himself as he allowed to be caught by Browns receivers. Overall, when targeted, he allowed a passer rating of just 2.8. Elite Stat: Eli Apple allowed just five catches from ten targets in coverage. Eli Apple’s second season has been far from dominant, but that changed on Sunday night against the Broncos. Apple was the most targeted of any of the Giants defensive backs, seeing the ball come his way ten times, but he was almost always in close attendance, surrendering five catches for only 38 yards, and breaking up one of the incompletions. Apple didn’t allow a catch longer than 11 yards. Elite Stat: Harrison Smith rushed the passer three times and had two sacks. Harrison Smith’s interception this week could have been due to sorcery, or possibly control of the Matrix, as he somehow stabbed the ball out of the air with one hand as he dived to his right and brought it in. That play aside, Smith also notched two sacks from just three plays on the blitz, and broke up another pass, allowing only two receptions from five targets that went for a total of 12 yards. Elite Stat: Adrian Amos was thrown at five times, allowing four catches for 20 yards as well as intercepting a pass for a pick-six. Adrian Amos scored a defensive touchdown on a fantastic return after picking off Joe Flacco, and while he allowed four catches from five targets when he was primary coverage, those passes went for a total of 20 yards. Amos ended the game tied for the team lead with seven solo tackles and four defensive stops. Elite Stat: Kyle Fuller saw 15 targets this week, allowing just five receptions. Kyle Fuller was thrown at an incredible 15 times in this game by the Ravens, but allowed just five catches for 43 yards. He broke up three of the incompletions, and was able to blank Breshad Perriman, Mike Wallace and Chris Matthews on passes thrown towards those three receivers. Fuller had the game of his career this week. Succop didn’t attempt a kick of 50 yards or longer, but did go 5-for-5 on field goals on the night, including 3-for-3 on kicks between 40 and 49 yards. Morstead was an expert at pinning the Lions back on Sunday, with three of his seven punts landing inside the opposing 20 yard line. He averaged 47.7 yards per punt on the day, and had one punt with a hang-time of 5.25 seconds, the most for a punt this week. The Ravens offense was stagnant on Sunday, but they were boosted by two return touchdowns on special teams. Campanaro was responsible for the punt return score, and averaged 13.7 yards per return on the four that he didn’t take to the endzone.